I took my S&W M&P to the range this morning and shot different ammo through it with and without the handguard to see how much of a difference in accuracy there would be. I was looking for some evidence of improvement before I chucked out the coins for a freefloat handguard. My S&W has a 16-inch barrel with 1:9 twist. When I took the handguard off to freefloat the barrel, I would feed one round at a time and rest the magizine well (without a mag inserted) on the sandbag. It made for a stable rest. I used a Leupold VXII 3-9X and fired 3-shot groups at 100 yards. This table shows the overall results. 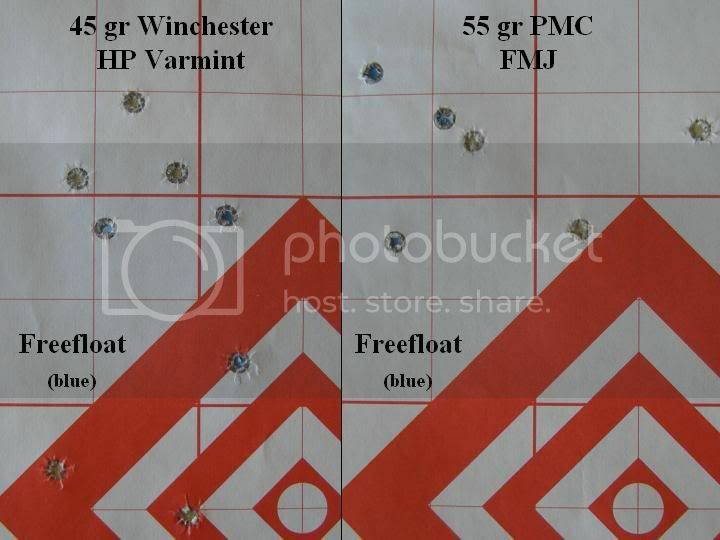 Though I saw a slight improvement in accuracy with the with the barrel freefloating, it was not significant and the best groups in each configuration were comparable. Here are the best groups. There was a slight shift in the point-of-impact with and without the handguard. So far, I've found the results inconclusive and not supporting the expense for a freefloat handguard. 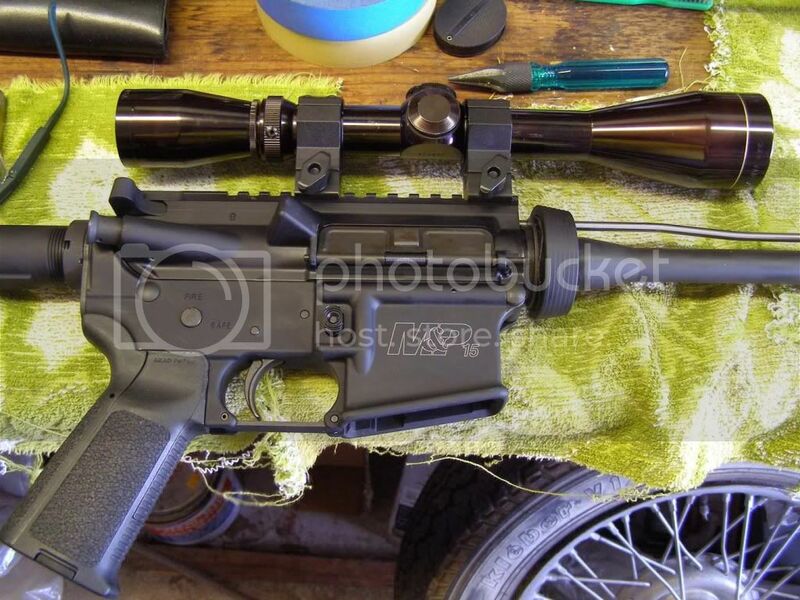 However, this was my first really shooting session with the AR after an initial break-in. I think I need to go back and repeat this test with 5-shot groups and see if point-of-impact remains consistent. Give me a couple of weeks report back. If others can share their experience with freefloat handguards that would be appreciated. Thanks for the post. I've always wondered the same thing. Not sure you will be able to compare without shelling out the bucks for the Freefloat tube. The main advantage of a free float tube is so that the sling pressure is not relayed to the barrel. If you set a factory hand guard vs a free float handguard using the magazine as the support point like you did I expect you will get the same results - inconclusive. A T-test or F-test would say they are from the same population. 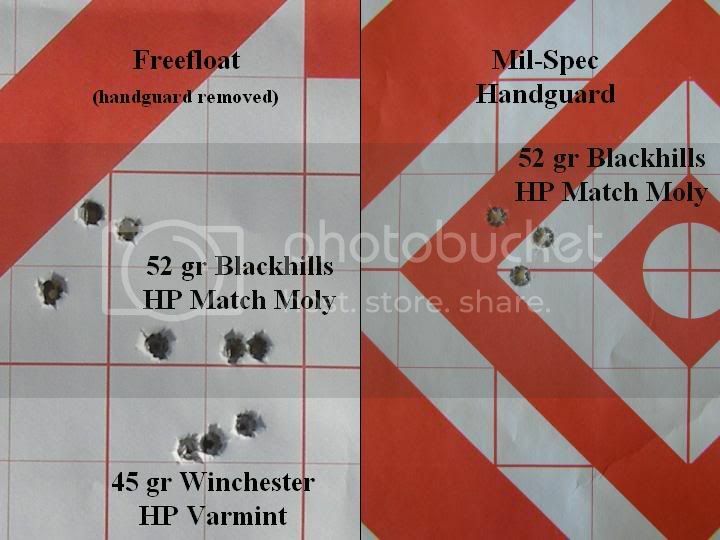 If you use the handguard as the support point or even attached a bipod and then shot free float versus stock handguard you MAY see the difference in point of impact shift between the two but I would think if you were consistent form shot to shot with support position on the stock the group size would be similar. If you move around on your bag with a stock handuard the poi will shift too opening up group size. As I said already - they main advantage comes if you are using a sling as changes in sling pressure will causes changes in POI. If you set a factory hand guard vs a free float handguard using the magazine as the support point"
I should have mentioned that I supported the rifle with the handguard on the sandbag when I shot those groups. I figured that this would be similar to my hand holding the handguard. Maybe for consistency I should have shot using the magazine well as the rest point even with the handguard on. Your point about using a sling is an important one. 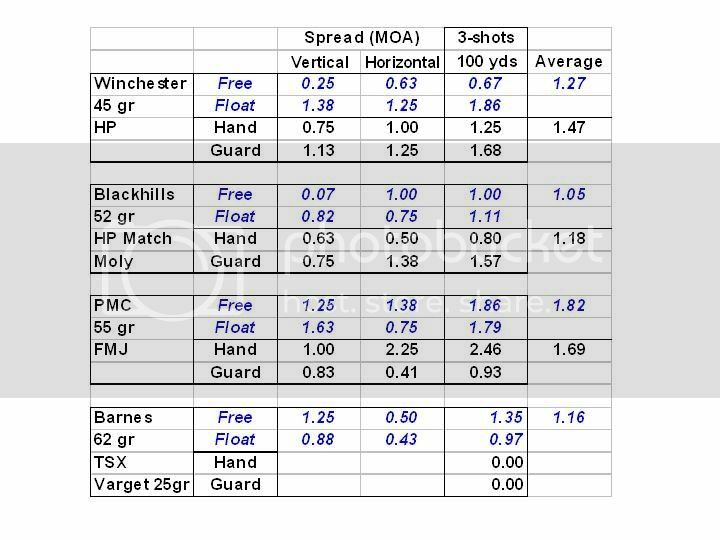 However, I have read where others claimed significant improvements in accuracy when using a freefloating handguard. I figure I have to shoot quite a few more rounds before I can quantify the accuracy advantage and any improvement in point-of-impact consistency. I think the advantage of a freefloated barrel is there. It will be fun doing all this shooting to find out how much! At least for now I know if I'm not using a sling, I really don't need to rush out and buy a freefloat handguard. My experince has been that a good trigger shrinks groups better than a float tube if you are not using a sling. The trigger on my S&W was only 6 pounds out of the box plus smoother than most mil-spec. I did the 15 minute AR Trigger mod and reduced my trigger pull to around 4 lbs (estimate) but have not measured it. It was simple. I don't feel liking I'm having to apply excess pressure to get the round off. It even comes as a surprise which is good. This mod worked for me and I will keep this rifle like this. I'm getting ready to build an AR that is more geared for accuracy and will get a good match trigger for it, most likely a single stage JP. Just installed a JP trigger in my Colt. Very happy with it, trigger pull went from a gritty, creepy 8 pounds to a crisp 4.5 pounds. This is with the stock hammer and hammer spring for reliability with all ammunition. When you say build - do you mean from parts or a new upper and a match lower? If you want the best Match grade AR service rifle upper Check out White Oak Precision /White Oak Armament or Compass Lake. Most shooters at Camp Perry do. Well I picked up my Barlett Enterprises lower receiver yesterday. So everything is possible from here. I'm not sure yet if I will build the upper from parts or buy a complete upper. I'm still investigating. Thanks for your suggested companies. I have mulled over the idea of building an AR from parts. I may be way off base here but I always felt that the lower was more of a tab A in Slot B assembly while an upper required a littel more skill and art to get everything lined out well. Any one done a build from parts? BTW - Slimjim -What did the Lower run you? Did it have a match trigger or a stock single stage? I purchased a stripped lower from MidwayUSA that was CNC machined by Bartlett Enterprises. They are on clearance for $99. That's basically half price. I don't expect that price to last more than a couple days.